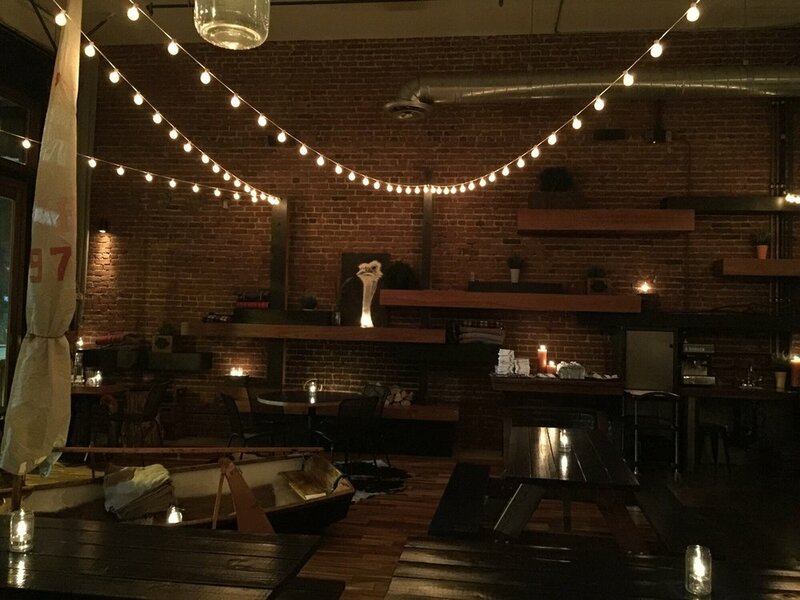 Exposed brick wall and air duct? Check. Whimsical decor? Check. String lighting? Check. Photo by Lynn N. via Yelp. First, let me just say that this is not a knock against hipster restaurants. Uncomfortable seating, old fashioned lighting and kitschy, house-made sodas aside, I eat at them all the time because the food is generally top-notch. And sometimes, you just want something tasty made of quinoa. And sometimes, you want to be impressed by just how much kale they can work in to any given dish. That said, there’s definitely an over-abundance of hipster restaurants in Los Angeles, and I am curious to know: what’s the most hipster restaurant that you walk, bike or transit to? Please submit your answers in the comments. Submissions should include information on how to reach the restaurant sans-car. I’ll follow up with a post featuring your responses, mapped out! Be in a tiny, hard to find location with no parking. Uncomfortable vintage/reclaimed chairs and tables that are at odd heights. Communal seating. Menu is written on chalkboard, or comes as a piece of paper on a clipboard. All items are some combination of vegan/gluten free/organic/artisanal/locally grown/rustic. A “new twist” on a “traditional fave” (i.e. baked cauliflower mac and cheese) and it’ll probably cost you $15. Entrees do not come with sides. What you order is what you get. Dessert menu includes something that has been deconstructed. Haha thanks, will definitely add to the list! Thanks for the suggestion, Kenny! I don’t exactly “do hipster,” but certainly the new owner of Clifton’s has given it some “hipster appeal.” I miss a few things from the old Clifton’s (like having several vegetable choices available at the same time, and like their carne asada), but I definitely do NOT miss the mac-and-cheese that had so little flavor you had to take their word that it contained cheese (I like the new mac-and-cheese much better). And 10e does have exposed brick, and a quirky light fixture. As well as a really good chicken kebab. And they’re both within walking distance of 7th/Metro. (Clifton’s is a bit challenging, but 10e is right on top). I’d recommend using Pershing Square Station for Clifton’s rather than 7th Street/Metro Center Station. Pershing Square is certainly closer to Clifton’s, if you’re on the Red or Purple, but I’ve typically just rolled into downtown on the Blue Line. And given the portion sizes at Clifton’s, it’s probably better that I have a nice long walk both before (from 7th/Metro) and after (to Disney Hall) dinner. Besides which, with the turnstiles and validators set up so that they can’t tell that I’m continuing on in the same direction, “Includes transfers to other Metro lines for up to two hours to complete a one-way trip” is pretty much meaningless if I make a dinner stop at the transfer point. Anna, you forgot one important uber-hipster criterion: prices on the menu must be written out in words rather than in numbers. You forgot ‘ear bleed noisy’. Perhaps tailored for millenials who prefer texting to actual Conversation. My girl is a hipster at heart and we are definitely foodies. I feel like our hobby is finding new places to eat. Forgive me in advance for this extensive list but it will definitely help you out. Pho Cafe in Silverlake. Most hipster thing about it… there are no signs displaying any business is actually present in the building. Take the 302 or the 2. Berry Bowl in Highland Park. Exposed brick, hipster Oxy students, and exotic Acai bowls. Oops I forgot to mention ORGANIC. Town Pizza in Highland Park. Gluten free and vegan options. NYC vibes. Both of these two are just steps away from the 83 bus stop. Most of the places in the Arts District, just a short walk from Little Tokyo/Arts District Station, the 62, and a few others. Urth Caffe, Wurstkuche, Cafe Gratitude, and many more. Love this, this is great! There are no hipster restaurants in the Gateway Cities. I always appreciate the Phantom’s ability to get directly to the point! Other hipster restaurant signposts would include orange wine paired with the wrong dishes and waiters that tell you every ingredient in the dishes and exactly how they are prepared.